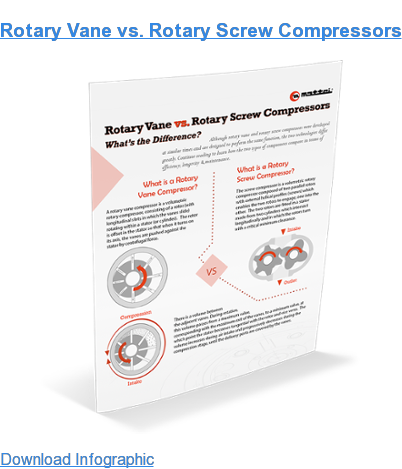 Rotary Vane vs. Rotary Screw Compressors: What's the Difference? Mattei's advanced rotary vane technology is simple: It features a single off-set rotor, supported by two, white metal Babbitt bushings (like the connecting rods in your engine) and spins at but 1,800 rpm or less. Blades/vanes slide in and out of the rotor to form compression pockets. A zero-wear MeehaniteTM treating process prevents wear to the stator wall or the cast iron blades, which ride on a thin film of lubricant. Backed by a 10-year warranty, the rotor stator unit is exceptionally durable and efficient. It is not uncommon to get more than 100,000 hours of service life out of Mattei's airends without a rebuild. 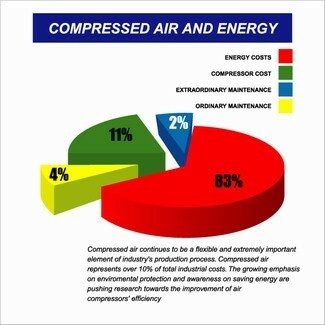 In comparison, rotary screw air compressors are complex and sensitive to precise tolerances. Screw systems are comprised of two parallel rotors with external helical profiles (screws), which enable the two rotors to engage, one into the other. The two rotors, fitted with four roller bearings and two thrust bearings, are placed inside a stator composed of two cylinders. These cylinders intersect longitudinally and the rotors turn with critical minimum clearances of speeds between 3,000 and 8,000 rpm, via belts and sheaves or gears. Oil is used to seal, cool and compress the air which results in blow-hole losses and declining efficiencies outside of the ideal speed range. Engineered bearing life is 50,000 hours; however, installed airend life ranges from 35,000 to 40,000 hours between major overhauls. The relationship between the effective air delivery and the geometric volume is the volumetric efficiency. Volumetric efficiency is affected in the rotor stator unit by the air leakage from the area under pressure towards the intake. It is important that these leakages are kept to an absolute minimum, as the energy required to compress the air which returns to the intake, is a loss. The smaller the internal leakage, the more the volumetric efficiency increases and the required power per measuring unit of delivered air is reduced (specific energy, i.e. kW/100 cfm). 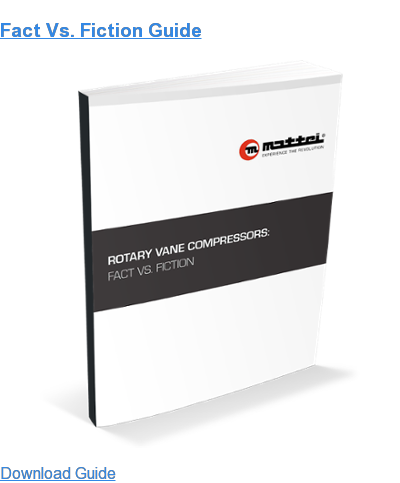 Mattei’s rotary vane stator is not subject to thrust forces, and remains balanced under load as pressure is equalized along the length of the rotor. Mechanical efficiency remains high (~90%) as there is near-perfect sealing. The oil services the shaft bushings and provides lubrication for the blades. The efficiency is linear across the functional speed range, which makes the kw/100 cfm ratings of the Optima and Maxima truly class leaders. In comparison, rotor screw airends are supported by roller and thrust bearings. Usually one rotor drives the other by means of the helical profiles. Sometimes, they are driven by a pair of external gears. During rotation, the screw profiles uncover an intake orifice at one end of the stator, through which the air enters and fills the volume between the meshing screws. On the opposite end, the meshing screws discharge pressurized air through a discharge port. During this process, some gas bubbles rise through the oil to escape along the blow-hole path, seeking the lower differential pressure across the length of the screws. This results in loss of efficiency, which becomes magnified as the speed varies above or below the ideal design range of each airend. 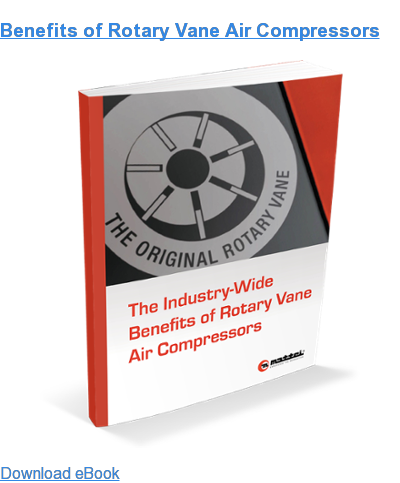 To learn more about the benefits of rotary vane compressors, we encourage you to read our eBook, The Long Term Energy & Financial Advantages of Vane Compressors.